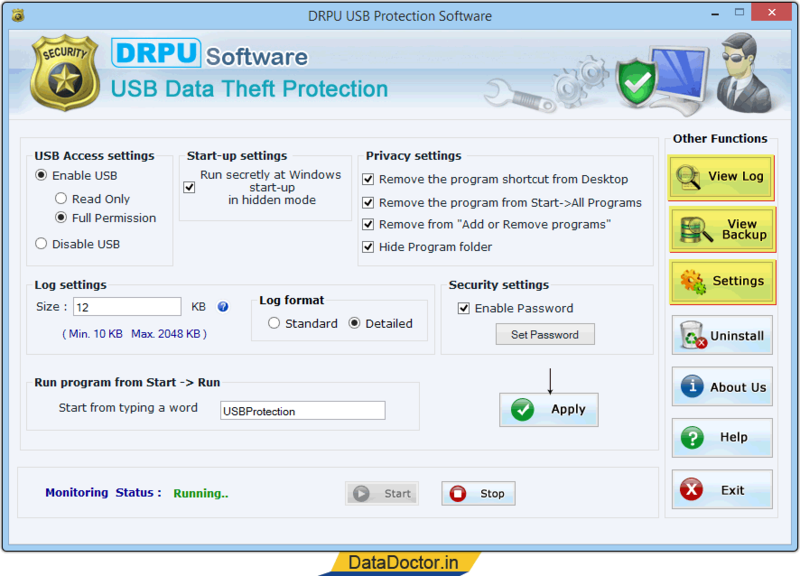 USB data theft protection tool is used to monitor the plug-in and plug-out activities of any USB mass storage device. USB surveillance utility maintain logs and capture photo of an unauthorized person, when a USB drive/stick is being used on any of the PCs. USB drive blocking software has password protected feature to restrict unauthorized person to make any change in software settings. There are various settings including Email Settings, FTP Settings, Camera Settings, USB access settings, start-up settings and privacy settings as shown in below screenshot. Please Contact Us for any Custom Quote. Anti-data theft software provides complete detail of windows edition, system details, user details, USB details (USB drive name and date/time) and network details including PC name, IP address, server name, domain name etc and saves information in txt or html file format at user specified location. Data theft protection software facilitates user to monitor the use of different USB mass storage device such as digital cameras, external hard drives, flash drive, removable storage device etc. » Software has various General settings including start–up settings, USB access settings, privacy settings, log settings and security settings etc. » Other Settings of USB Data theft Software include Email settings, FTP settings, Camera settings and Import & Export Settings. » Camera Settings feature of Software provides an option to capture photo of user during connection and removal of USB Devices. » You can also export your log in html or text format. » Software also keep date-wise backup of every log after completing the specified log size. » Password protected USB Monitoring Software supports all major usb devices.